The great thing about WordPress is that, as an open-source and community-built platform, anyone can contribute code to it. Whether it’s small fixes, or big new features, patches can be submitted by anyone and everyone. Once such patch that I submitted was an improvement to the existing export tool that is built into WordPress itself. Unfortunately, that patch has not been merged into core yet and I’m not sure when it’s going to be, so in the mean time I packaged it up as a plugin. For lack of anything more creative, I named it Export Plus. The existing export tool allows you to select only one post type and, if it is anything other than the built-in types, you cannot filter what content you export. This is hugely limiting and can make exporting data incredibly frustrating. On top of that, the existing tool uses raw database queries instead of making use of the WP_Query class, which would be safer and more manageable. Export Plus adds a new export tool to the WordPress dashboard that allows you to select as many post types as you like and filter them all across your desired date range as well as their author. You can also select which category to export for posts and I will be adding further taxonomy selection for all other post types in a future release. Additionally, this plugin uses WP_Query instead of raw database queries. As with Quick Empty Trash, Export Plus is built for anyone to use and isn’t tied to a specific industry or type of site. The way I see it, this plugin offers such an improved export experience that there’s no reason it shouldn’t be included in core (but I’m obviously rather biased). As with so many other plugins, I built this tool to make my own life easier. 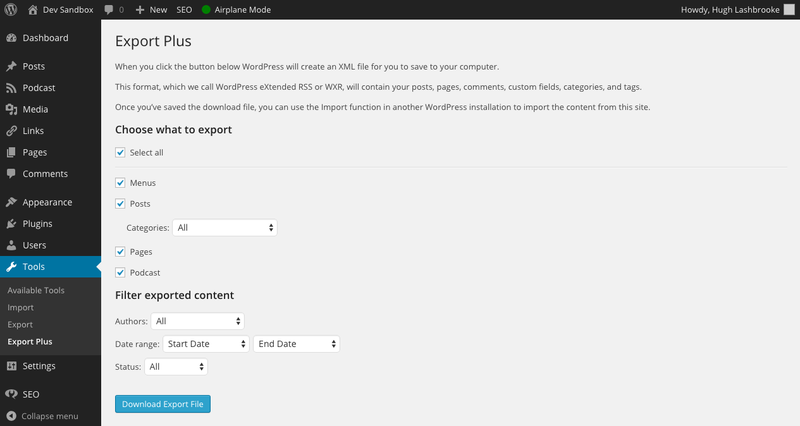 The current export tool in WordPress is exceptionally frustrating to use and I really wanted something that would be more flexible and more useful. One question: How does your plugin handle media? In the normal exporter, media items aren’t exported when only selecting “posts”. It would be great if you had a look at the unit tests – would really help speed up the process of getting the patch accepted into core. If the media files are attached to the post then it exports them with the post (just like default exporter), but unattached media is ignored. I think it might be good to include media as a ‘post type’ option when exporting though – I’ll look into that for a future release! Thank you for this article and for the plugin, i think that i gonna need it in not so far.